The Summer Sunshine is a spectacular summer bouquet, packed full of seasonal flowers that exude warmth, joy and cheer! With eye-catching reds and summery yellows, this colourful bouquet is sure to capture attention and invite admiration wherever it goes. 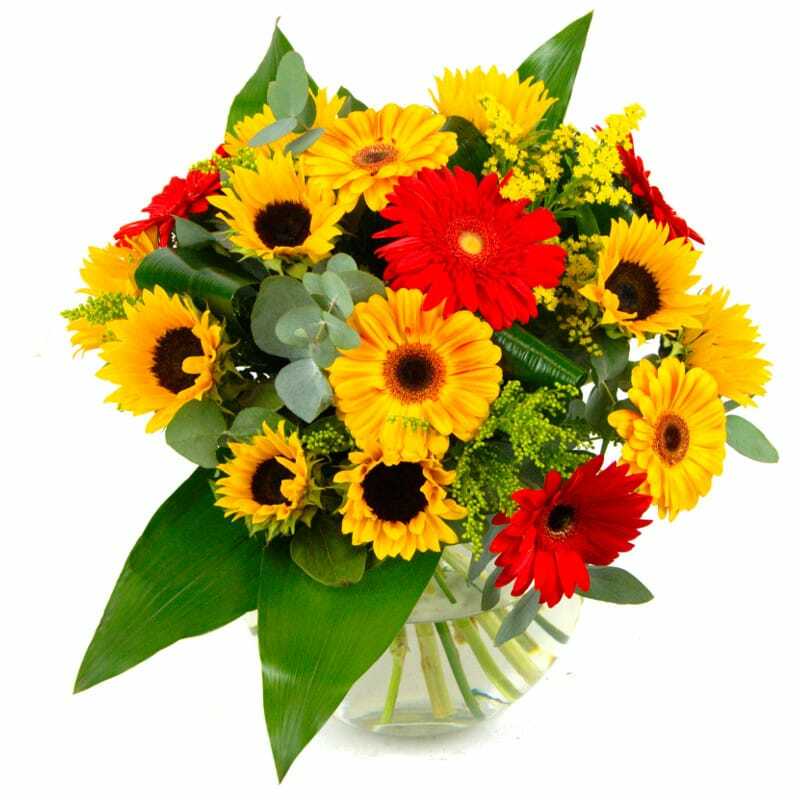 A cheery hand-tied bouquet that consists of sensational summer flowers such as germini, solidago and of course sunflowers, Summer Sunshine is nicely set off with eucalyptus and lush green leaves. This outstanding summer bouquet can be delivered to any address in the UK. The Summer Sunshine bouquet makes a superb gift or a tempting treat and will look amazing where ever it is situated. This beautiful floral arrangement is also great value for money; free delivery is included for just £29.99! For that extra special personal touch, why not add a yummy box of Lily O'Briens Chocolates, a Handwritten Greetings Card, a chic glass vase or an adorable teddy to accompany your beautiful fresh hand-tied Summer Sunshine bouquet. We also have a large selection of bouquets for every occasion as well as many arrangements containing sunflowers and an array of different gift sets to suit every occasion. Go Deluxe! Choose this option and our expert florists will add 25% more beautiful flowers for just ?5.00!